Bitcoin was created in 2009 by Satoshi Nakamoto with an intention to create financial transactions without any middlemen such as banks. Started as a small purpose, now bitcoins can be used to book hotels, shopping and even buying Xbox games. Without any tie-up with international regulations, bitcoin serves as cheap and easy option to purchase merchandise and use as an investment instrument too. Using Bitcoin is not rocket science, with several mobile apps; one can trade in bitcoins just by sitting at home. Let’s explore top 10 apps in the same genre. With a massive number of users of 3 million, Zebpayis is considered as the best bitcoin app in India. Apart from buying, selling and trading in bitcoins, Zebpay can be used for Ether, Ripple, and Litecoin too. Zebpay comprises many exclusive features such as order matching trade, market-driven pricing system and a real-time price chart of all coins in the market. With the rate widget feature, you can check the trading prices of all cryptocurrencies displayed on your home screen. Moreover, the price alert feature helps you set up your custom price alert on your screen. As of now, Zebpay is one of the most trending Bitcoin apps in India. The bitcoin wallet is an easy to use app that allows you to pay using QR scanning mode. Made with peer-to-peer technology, the wallet is decentralized and enables you to pay without any registration process, cloud or web service. Apart from QR code, you can send or receive bitcoins using reliable NFC and URLs. Bitcoin Wallet also allows you to convert your bitcoin value according to your national currencies. The Bluetooth pay option in Bitcoin Wallet provides you an advantage of paying through Bluetooth mode when you are out of internet service. 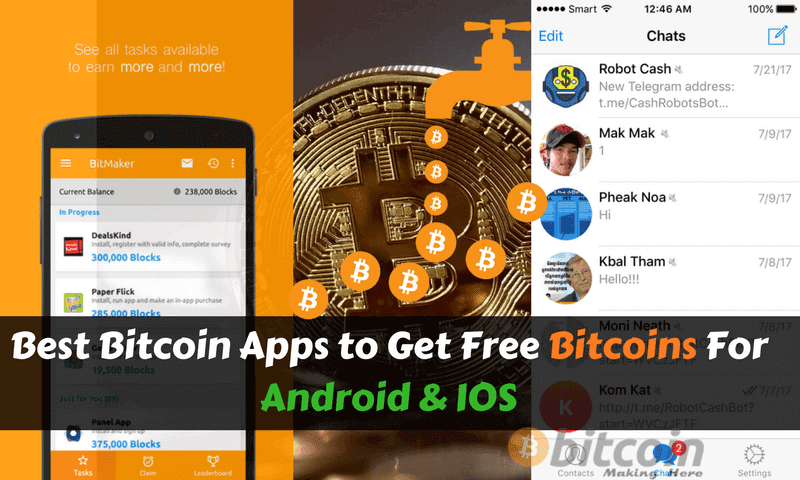 This app offers a platform to earn Bitcoins in large volumes. Free Bitcoin Miner is one of the easiest ways to obtain Bitcoins that’s also at free of cost. To receive free bitcoins, all you have to do is open the app for around half an hour and let the advertisement play in the background. You don’t have to look at the advertisements too if you don’t want to. Either play games, listen to music or watch your favorite shows and let the application run. After half an hour, close the advertisement, and you will be amazed to see free bitcoins credited to your account. With Coinbase wallet, you can trade bitcoins, ether and litecoin anywhere just by using your email, currency address or email within a second. Apart from that, this app allows you to convert your bitcoins to any currencies around the world. With a highly secured vault, your cryptocurrencies will be stored with an additional security phase. Magic Bitcoin comes with a six-digit pin and OTP verification process, making it the most secured wallet to date. With Magic Bitcoin app, you can exchange and trade Bitcoin as well Magic Bitcoins too. You can convert your Bitcoin to Magic Bitcoin and vice versa. Magic Bitcoin already includes 250 millions of pre-mined Bitcoins and as per the app, there are more 250 million of Bitcoins will be mined towards 2021. Bitcoin India comes with both mobile apps and web platform. With this app, you can transact your cryptocurrencies through several digital tokens such as BTS, BTC, CLUB, ETH, DOGE and several other modes. With Bitcoin India app, you can sync all your transactions on a real-time basis with an advanced level of security feature. The app provides 2fa security process along with essential security modes. Even if you lost your password, you could use the 2fa mode to unlock your transactions using google authenticator. Unocoin is house to more than 1 million customers in India when it comes to transacting crypto assets. Unocoinis supported by many renowned investors such as Mumbai Angels, Blume Ventures, Funders Group, etc. and managed to raise 1.5 Million USD. With a membership at NASSCOM, Unocoin is among the top 30 startups as per YourStory India in 2017. Unocoin includes attractive features such as Live price tracker, regular news updates related to Bitcoins, deposit and withdrawing INR along with several attraction Bitcoin offers. Transact seamless anywhere and anytime with Blockchain Wallet. This app allows you to exchange between your Bitcoin, ether and Bitcoin cash along with a 100% user control over your funds. The two-step security features add an extra layer of security on your wallet along with QR code support, more than 20 currency exchange rate, and paper wallet import feature. Now you can safely transact your cryptocurrencies in 18 languages with the additional security of TOR blocking technology. Coinsecure is a small app that runs in your background without hogging much memory. With just a few clicks, you can buy, sell, and exchange your Bitcoins without any hassle. The timeline feature of Coinsecure allows you to track your transaction history with full details. So, you will find it useful than other unnamed apps circulating in the app store. Last one but not the least, Binance is an all in one platform where you can deposit your Bitcoin and withdraw them at any time. No matter where you are from and what language you speak the bilingual support service of Binance, helps the user to transact without any language barrier. Binance with its easy to use interface and hassle-free customer service system has efficiently managed to acquire more than 1 million subscribers from more than 200 countries across the world. Thus, you can rely happily on this app. The above-said apps are the best one amongst the others available. However, the rising popularity of bitcoin is making new apps to get launched very frequently. So keep yourself updated for any new app from time to time, you never know when you might have another app topping the above list.